Not sure what’s gotten into me – I’ve been making more sweets than usual. I’ve often wondered why I lost my love for desserts – I adored them until I hit about 30, then it all changed. I absolutely crave – need – spice, but I could go forever without a piece of cake or candy and be just fine. Just give me my hot and spicy, cheesy and salty grub and I’m a happy girl. On the other hand, my family is a bunch sweetaholics, so I guess I do get some satisfaction from making them happy. Plus, they get way more excited when I make a dessert rather than a dinner recipe. They seem a tad more tolerant of my incessant snatching-the-food-away-to-get-to-the-window-before-I-lose-sunlight-for-the-picture moments. I loved red velvet cake when I was a kid, so that’s one of the reasons I wanted to make these, not to mention that I had a vaseful of beautiful roses from my Foodbuzz 24×24 party that were about to wilt away. First make the petals. Soak them in cold water for a few minutes, drain, and soak again. Rinse. Whisk together the egg(s). Very carefully brush the petals with egg white, then lay flat on parchment paper. Lightly press each side in the sugar and place back on the parchment. Combine the flour, baking soda, salt and cocoa powder; set aside. In a stand mixer combine the oil, buttermilk, and sugar on low until combined. Add food coloring, eggs, vinegar, water and vanilla with the mixer still on low until incorporated. Add dry ingredients 1/2 cup at a time (still on low), stopping the mixer between each addition to scrape theasides down. Mix until just combined. Bake in cupcake liners for 20-30 minutes, or until toothpick comes out clean. Cream the butter and cream cheese together in a mixer. Slowly add the powdered sugar a little at a time. Add vanilla and mix on low until combined. 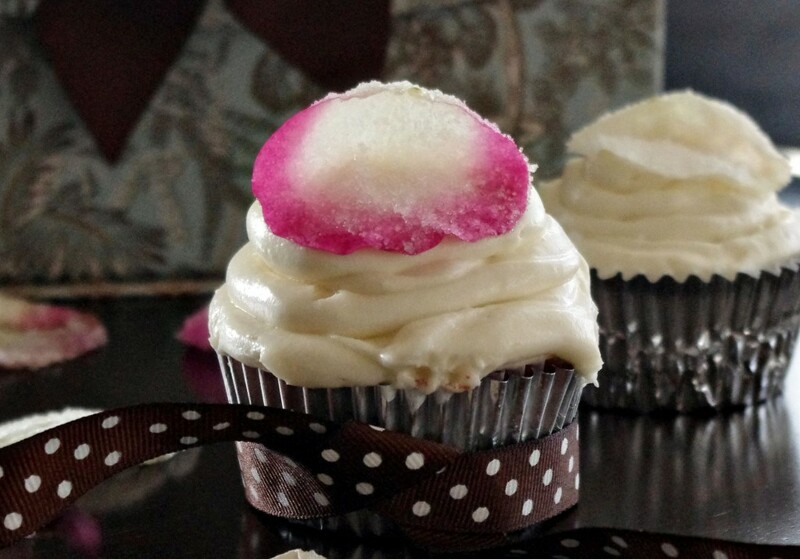 Frost the cupcakes, then add a rose petal on top. Store in the refrigerator. Yes, I did taste them. The cake was very dense and moist, and the cream cheese icing is perfect. cake, candied, cream cheese, cupcakes, desserts, frosting, icing, red velvet, rose petals, roses, sweets, valentine's day. Bookmark. What a perfect for a Special Valentine, it really looks delicious! Hope you have a wonderful week and Special Valentine’s Day. Thank you so much for sharing with Full Plate Thursday. My tongue has been grazed by this recipe’s picture alone. I thought I’m only able to find recipes like this at http://www.gourmandia.com but I guess its not. Sometimes its also good to explore the web for something new. These look so tasty! Thank you for sharing this at simply creations link party! I love the rose petal extra touch! Thanks so much for sharing on Weekend Potluck! Those look incredibly delicious! 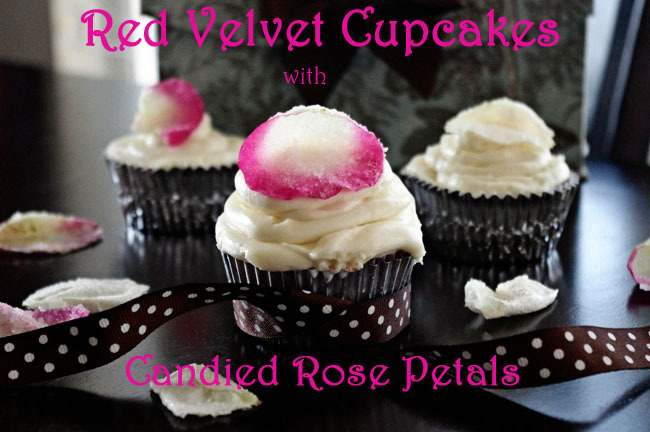 And I love the whole candied rose petals idea! I could not live without sweets in my life (even since I turned 30), wish I couldn’t though! These look so pretty, and perfect for V-Day!